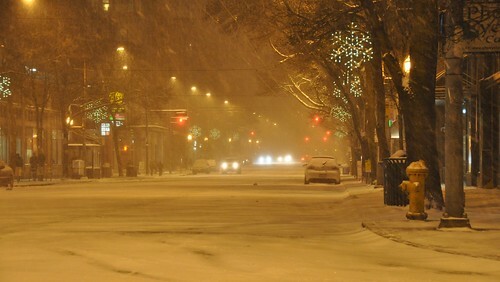 Seattle winter wonderland pictures - To grrr, or not to grrr? That is the question. Got geared up to brave the snow, wind and cold temperatures (pretty much my snowboard outfit minus the helmet and boots). Tricky thing getting good pictures when the weather is so bad. Most came out better than planned. I don't like how sodium vapor lights cast orange color, but I left the color balance alone. It's still hard to catch falling snow at night though. If the weather wasn't so bad and I had some shelter I would have tried some long exposure pictures. I think it looks lovely, orange glow and all. Yep, that's sort of why I left it alone. Auto white balance did a decent job. I saw other people trying to take flash pictures. Most pics with flash and snow do not mix well. I can't believe Broadway was that empty! This was about 10:30pm last night. People finally got off the roads before then. They sure weren't coming up from downtown. This just proves that we live in the best part of town! Well done! I like that picture. The coloring has a certain warmth (no pun intended) to it. What a gorgeous shot - it coulda been straight out of "It's a Wonderful life"
Thanks for posting it - and Merry Christmas! If I had time I would have sent this out as Christmas cards--would have been perfect. Thanks!